Preserving the historical heritage of railroading and trolleys in the Santa Clara Valley of California. The CTRC Blog is a chronological collection of postings and items of interest. Our search page is available to help you find anything that might not be immediately visible. For the latest weekly updates please visit our Facebook page. Our quarterly newsletter is The Clearboard. The CTRC website has been updated and (hopefully) reinvigorated. Content from the old website has been moved over, hopefully without much damage or loss. The CTRC website is intended to be a living site: fresh content, photos, and corrections, fresh content are invited. Had a big crew today, Peter, Kyle, John Z, and Bill Jump, were there in addition to the more usual Tom,Larry, Denis, JB and I.
John Z and Bill Jump were servicing equipment, Kyle cleaned and painted some studs, Larry and Denis worked on the cab lining, and Tom and I worked on identifying areas where we still have issues with the boiler. 4:30 p.m. to 7:00 p.m.
At times, it has seemed to me that we have not accomplished much during this past year. I'm very wrong. With the small but dedicated crew, a lot has been done. Not much accomplished today. Lower temperature and moderate wind kept all hands close to heaters. Machining of the right side reverse shaft bushing is complete. Today the bushing was installed. A number of different machining processes were required to turn the $240.00 piece of bronze into the required part. Big thank you to AJR. 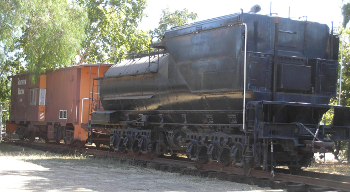 Today the left crosshead was returned to the locomotive. 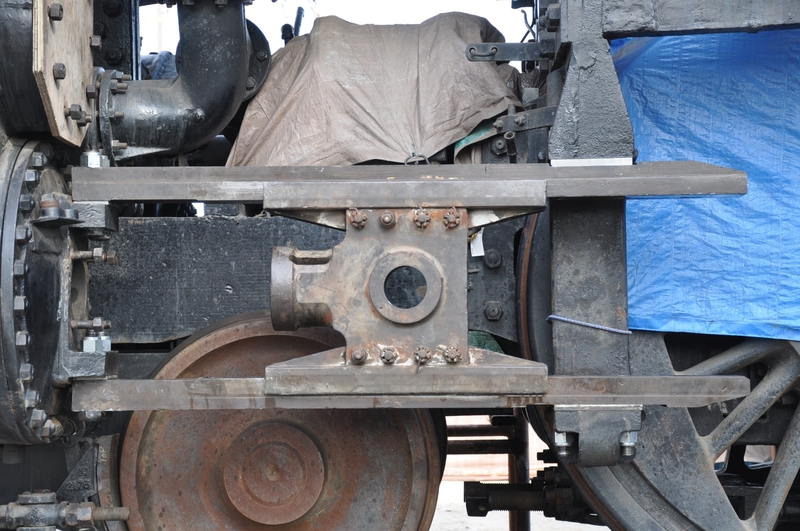 With the crosshead in place, bolts were installed in the lower guide. All of the news is not good. History San Jose Presents "The Way to San Jose"
Sometimes it might feel that not much is being accomplished, but my notes show that is not the case! Weld all remaining stay bolt holes - about 14. Click here to view a summary of all posts. © 2019 by California Trolley & Railroad Corporation (CTRC). All rights reserved.